April 3, 2015—Drivers trying to get to work or home in a hurry know traffic congestion wastes a lot of time, but it also wastes a lot of fuel. In 2011, congestion caused people in US urban areas to travel an extra 5.5 billion hours and purchase an extra 2.9 billion gallons of fuel costing $121 billion. But despite the tangle of vehicles at busy intersections and interstate ramps, most of the country’s highways are open road with vehicles occupying only about 5 percent of road surface. Scientists with the Urban Dynamics Institute (UDI) at the Department of Energy’s Oak Ridge National Laboratory are working to reduce travel time and fuel consumption by developing a computational framework for connected vehicle technologies that facilitate vehicle-to-vehicle communication, as well as communication between vehicles and traffic controls like traffic lights. Researchers envision vehicles exchanging information—such as location, speed, and destination—to generate individualized instructions for drivers. Watch a visualization of the process: https://youtu.be/C32qUDqfgns. The first step for the project team is developing decentralized control algorithms that govern how vehicles will communicate locally among vehicles interacting directly on the road but also act globally to optimize traffic flow across a city. 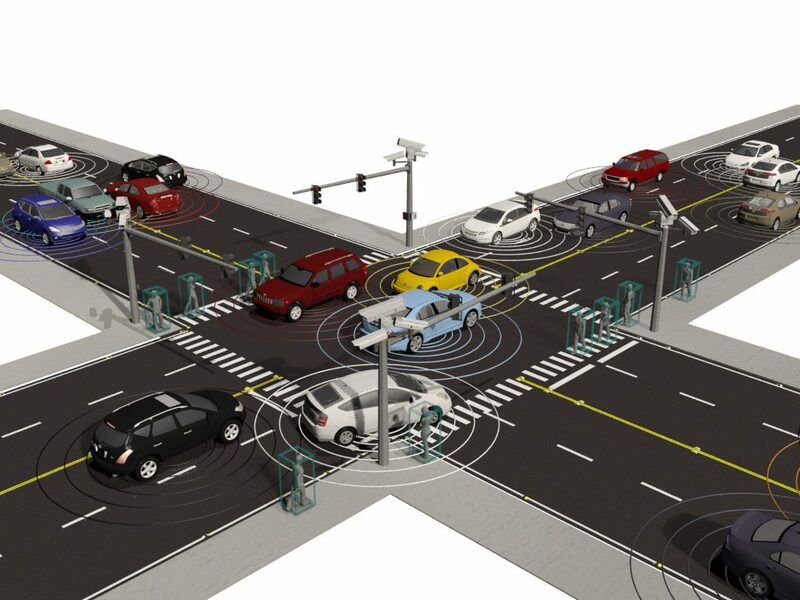 The computational framework uses “decentralized control” algorithms because, realistically, all the vehicles in a city cannot communicate information to a central control center due to the staggering amount of data that would be involved. “The first phase is an exploratory project. We’ll validate our framework through simulation,” Malikopoulos said. The second phase of the project will connect the team’s communication framework with a transportation analysis simulation system that uses data analytics to simulate traffic conditions in real urban areas to predict congestion. Simulations will predict and plan traffic flow based on large-scale data, such as the layout and population distribution of the area that reflects driver activities (for example, school zones are likely to be busier early in the morning and mid-afternoon, whereas entertainment districts are likely to be more congested during evenings and weekends), as well as the destinations and schedules of the connected vehicles in the simulation. Phase two simulations also will allow the team to begin exploring questions related to cyber security and possible incentives for drivers to follow connected vehicle instructions, such as digital ticketing. Funding for the research is provided by ORNL Laboratory Directed Research and Development program.